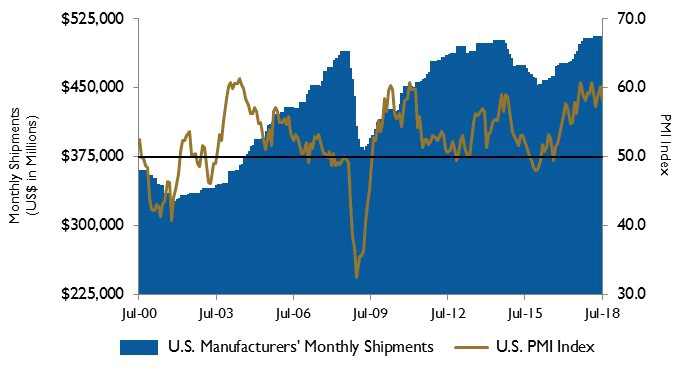 The Institute for Supply Management’s Purchasing Managers’ Index (PMI) decreased from 60.2 percent in June to 58.1 percent in July, the lowest reading since April. The New Orders Index fell 3.3 percent to 60.2 and the Production Index fell 3.8 percent to 58.5 percent. Tariffs are still a concern for respondents to the PMI with one executive replying, “We have already seen steel prices increase due to the threat of tariffs and are seeing kickback from our customers due to the higher prices.” Another issue for manufacturers is recruiting skilled workers. Image 1. Stock indices from August 1, 2017 to July 31, 2018. Local currency converted to USD using historical spot rates. The JKC Pump and Valve Stock Indices include a select list of publicly traded companies involved in the pump and valve industries, weighted by market capitalization. Source: Capital IQ and JKC research. Industrial production rose 0.6 percent in June, with output from the mining and manufacturing sectors growing 1.2 and 0.8 percent, respectively. The manufacturing sector was driven by a 7.8 percent increase in motor vehicles and parts production. Excluding motor vehicles and parts, factory output rose 0.3 percent. Showing no positive effects of recent tariffs, primary metal manufacturing was flat. The U.S. economy grew at its fastest pace in almost four years, with second quarter gross domestic product showing an annual rate of 4.1 percent. Growth in the first quarter of the year was 2.2 percent. The strong second quarter was due to large increases in durable goods orders, investment in nonresidential construction, exports and government spending. Personal consumption expenditures grew 4.0 percent after 0.5 percent growth last quarter. Weak home construction and increased imports lowered second quarter growth. Declining for the fifth consecutive year, U.S. energy expenditures reached $1.0 trillion in 2016, a 9 percent decrease from 2015. 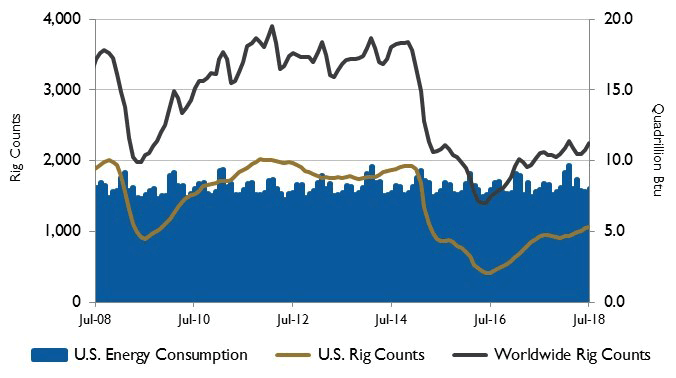 The decrease was due to lower energy prices, since total energy consumption has remained unchanged since 2013. The U.S. average energy price was $15.92 per million British thermal units (Btu) in 2016, the lowest since 2003, when adjusted for inflation. Average energy prices reached their peak in 2008 when they averaged $24.13 per million Btu. As a percent of U.S. gross domestic product, total energy expenditures were 5.6 percent in 2016, the lowest level since 1970. On Wall Street for the month of July the Dow Jones Industrial Average gained 4.7 percent and the S&P 500 Index increased by 3.6 percent, their biggest monthly gains since January. The NASDAQ Composite grew 2.0 percent, registering its fourth straight monthly gain. Trade war fears continued to affect the market, as early in the month the U.S. imposed tariffs on $34 billion worth of Chinese goods, which caused China to retaliate with tariffs on equal amounts of U.S. imports.